Hello friends! My wish’s come true: there are so cold and windy. At last I can wear warm knitted clothes and enjoy autumn weather. Anyway, I also wanna share with you one news. Yesterday I’ve received amazing eye glasses, which are suitable to each outfit! Thanks to Firmoo.com for this lovely gift. Their production is high quality and customer service is so good! You can upload your picture on their website and choose glasses which exactly will suit to your face! You know, I really love it cause I’ve been using glasses since 10 years old and I’ve deal with great number of glass companies. And the most pleasant thing is the first glasses is free (you can check details here). Guys, do you like my new glasses? Привет всем! Мои желания исполняются: у нас наконец-то осень! Как видите, я в теплом свитере среди желтой листвы. Хочу поделиться с вами новостью: вчера мне прислали очки, которые подходят буквально к любому наряду. Спасибо Firmoo.com за этот чудесный подарок. Я ношу очки с 10 лет, поэтому не понаслышке знаю, как порою трудно выбрать нужную модель. На сайте этой замечательной компании вы можете загрузить ваше фото и подобрать очки, которые подойдут к форме лица. И еще одна новость: первая пара очков бесплатно (детали можете узнать здесь). Как вам мои новые очки? Amazing glasses and I love your sweater! Hi dear, I love your new glasses, they look so stylish! Really great choice! Also beautiful sweater and bag! im so happy that you like my facebook *. * thanks!!! Hiii sweetie!! Your glasses so great! I love! A big kiss muaks!! Those glasses look great on you! I love your sweater! Hi honey, well I changed my glasses just two weeks ago, what a pity. Yours are beautiful and you wear them well! you look great in these glasses! Love your sweater! I love your burgundy bag!Great post! you look pretty! You look perfect! Soo beautiful! LOve the way you styled he glasses ! Green definitely looks great on you! They're so cool!!! I love this kind of frame!!! Love those glasses. They are so pretty and very stylish. You look great in these glasses and we are getting 1 last heat wave today! cool outfit and nice gift!! these glasses are so cool! match perfeclty with your hair!! love the color of your sweater, it's such a gorgeous green. your bag is s pretty too! I absolutely LOVE your look here, and LOVE that clutch! Absolutely gorgeous. Очки великолепны!!! И очень Вам идут! I love these glasses on you! Wow! 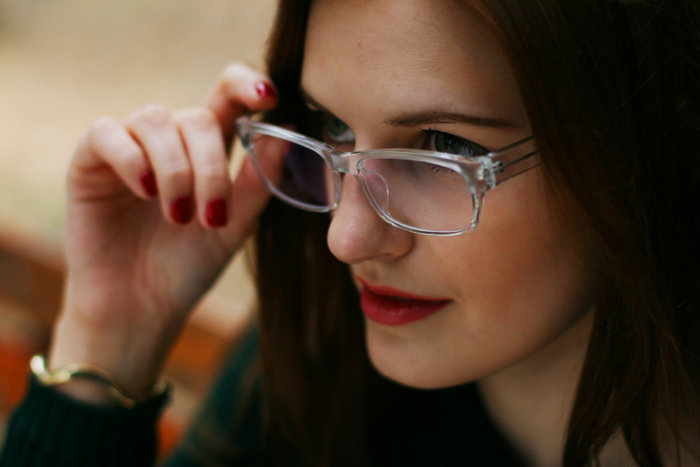 I like this post, outfint and your glasses! I´d like to follow each other, altough i follow youo now! (I,m yours #423 follower) Let me know if you want to follow me! 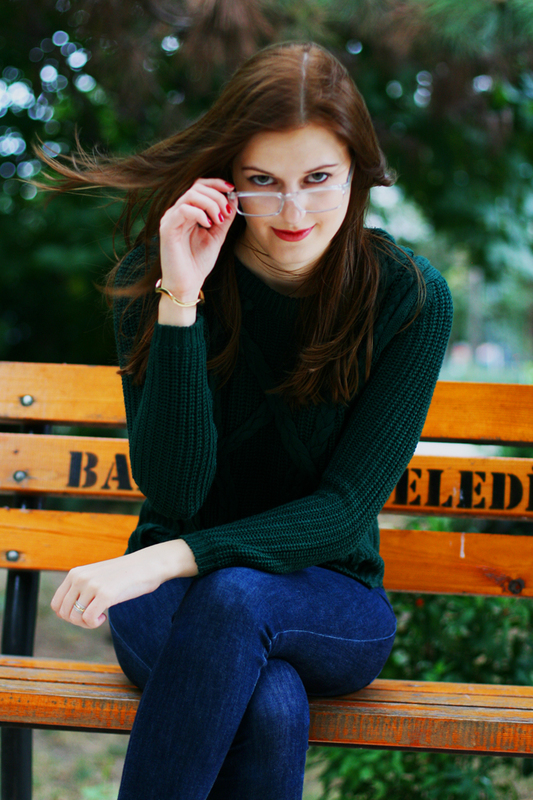 Adorable glasses, and I love the color of your sweater! I got glasses from Firmoo too!!! These are GORGEOUS! You look great! Thanks for stopping by, P.S your profile picture looks great! 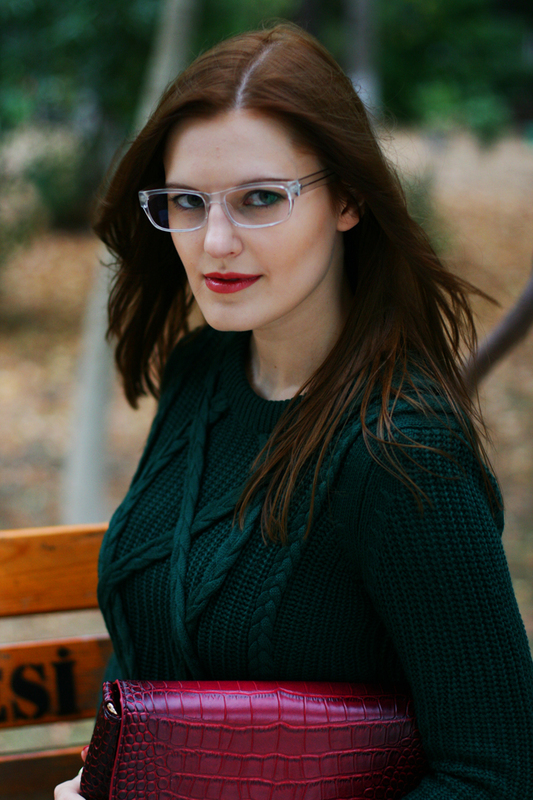 Love the transparent frames! You make them look so good. Also, I want to steal your sweater! Love the cable knit and that's my favorite color! Love the sweater, great colour! I love the glasses on you! wow, those are sooo cool! Have a great day Viktoriya! i love those glasses! i've been playing it safe with my glasses for the past few years sticking to my comfort zone but I definitely need to try something else! Wow. These are soo cool! Fab choice! Why didn't I see them, when I was ordering mine? I love the glasses they are so simple and chic perfect for your face!! I love your style girl. Your creativity when in comes to personal image is amazing. wow amazing sweater and I loove ur glasses! Look so good on you! Love your sweater too, your new follower !